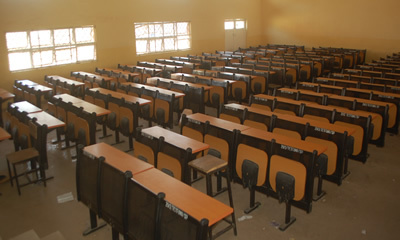 The present Sa’adatu Rimi College of Education, Kumbotso was set up in 1981 by the Kano State government. The initial site of the College (then known as Advanced Teacher’s College, Waje) was near the Katsina Road Pilgrims Camp. In 1982 the college was renamed college of Education, kumbotso and moved to kilometer eleven along Zaria road, Kano and was placed under the then Kano State Institute for Higher Education. The Institute of Higher Education was however decentralized in 1987 and the three Institutions Kano State Polytechnic, Kano State College of Education and Kano State College of Arts Science and Remedial studies under the umbrella became autonomous. At that time the College has two campuses, the one located at Gumel and the other in Kumbotso districts. The central administration known as the office of the Provost was situated in Gumel. The creation of Jigawa out of the former Kano State led to a split of the College into Jigawa State College of Education and Kano State College of Education. 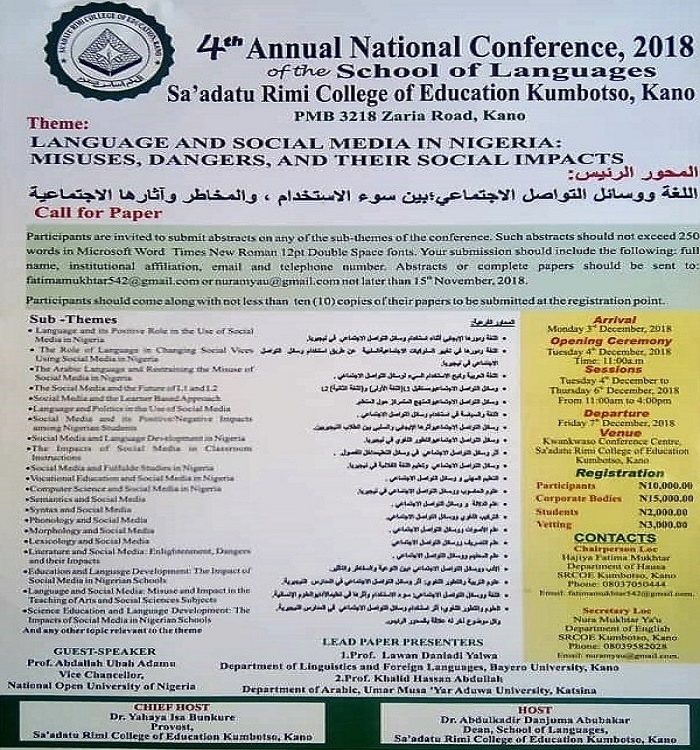 Moreover, the Kano State College of Education was equally splitted into two specialists’ campuses, Wudil and Kumbotso, the former handles sciences and vocational Education courses while the later handles Arts, Languages and social sciences. With the creation of Kano University of Science and Technology the two campuses merged again in Kumbotso. The College was renamed by the Kano State government after the name of the deceased wife of the first civilian governor Kano State Hajiya Sa’adatu Abubakar Rimi. Hence, the name SA’ADATU RIMI COLLEGE OF EDUCATION, KUMBOTSO. To offer courses of study, training and research in Arts, Languages and sciences: leading to the award of the National certificate in Education (NCE) or such equivalent or Higher qualifications and such professional courses allowed by law. On successful completion, candidates will qualify to teach in primary schools, post primary schools and its equivalent. To promote through teaching, research and other means the advancement of knowledge and its practical application to the need of the state. To organize from time to time in services Vocational courses, seminars conferences and workshops for serving teachers and educational administrators. To create facilities for research and its dissemination of knowledge with respect to the teaching profession. Production of highly knowledgeable, qualitative, creative and motivated professional teachers through our Pre service and In service programmes for nation building and global acceptance. 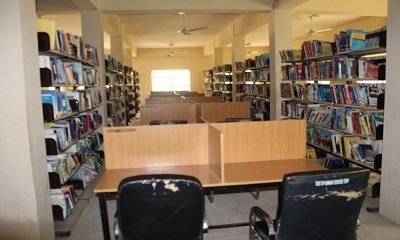 Provision of good, conducive and learner friendly environment for teaching and learning in the college. Encourage universally acceptable best professional practices in Teacher Training pedagogy in the college. Create a proactive academic culture of exchange and experience sharing. Provision of opportunities for capacity building and professional development for all staff. Establish standards in the evaluation processes of the college. Encourage and support sound ICT culture in the College community. Collaboration with the immediate local communities and other education stakeholders as well as development oriented partners to attain the vision and goals of the College. Governing Council: The College is governed by a Council appointed by His Excellency the Governor of the State. The office of the Provost: The Provost is the Chief Executive and academic leader of the college. 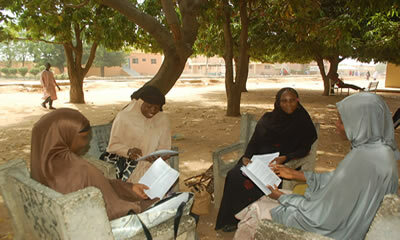 He is directly responsible to the governing council or the state Commissioner of Education in the absence of the council. All officers in the employment of the college are under the Provost. The Provost is assisted by a Deputy. The office of the Registrar: The Registrar is the Chief Administrator of the college. He reports directly to the Provost. The registry has four major units, each headed by a Deputy Registrar. They are a- Establishment b- Academic c- Students Affairs d- Planning research & statistics. our students have a unique life style. This makes our environment unique.